Explore Barcelona with your taste buds. Let’s share a table! Experience, passion, knowledge, fun. Those are the main ingredients of the best Barcelona private tour guide. Since 2012, the routes of Barcelonina reveal authentic spots, quiet squares and charming streets. In addition, some of our tours will take you off the beaten path to discover an unusual Barcelona. This is the first time you visit Barcelona? You know the city but you want to explore it with a local guide? Here is a sample of our proposals. Here you have our most popular guided tours in Barcelona. If you are reading this lines, is because you are looking for a private tour guide. Welcome to our site! Here you will find our Signature Tours in Barcelona. With Barcelonina you will see more than you think and you will experience instead of just looking. In other words, the tours we propose are designed to be time-efficient and as a result, we provide a unique touring experience every time. Beyond the ingredients of the best private guide, there is one of very important, the ingredient that gives full meaning to our visits: the city of Barcelona. Its history, its architecture, its gastronomy, its art, the geniuses that lived there, the sea and its citizens give it a unique, complex and rich personality. Looking for the Perfect Tour? Would you like to visit Barcelona in a tailor-made tour? If the answer is yes, we are your partners in Barcelona. Your ideas and desires plus our expertise will create your perfect stay. Given that we are on the ground, our ideas and contacts will create unforgettable visits. For example, we will open doors for artisan workshops, teach you how to cook a paella, enjoy it as a lunch and participate in one of the most universal Catalan traditions: els castellers. Actually, our Barcelona tailor-made tours are ones of our best sellers. We just need to know about your interest and our grey cells will start to plan your dream tour! Why discover Barcelona with us? Why a guided tour of Barcelona with a local guide? “What to see in Barcelona”, this is probably the first questions that pops up when you choose Barcelona as your next destination. After reading thousands of blogs or guide books, the answer is: a lot. This is where the Barcelona private guide service begins. In the first place we can advise you the most interesting visits and also we optimize the itineraries. That way you will see more than you imagine now. In fact, a two-hour tour, for example, through the Old Barcelona will give you the keys to understand the history of the city and also to explore it without getting lost. In addition, the valuable assistance of your Barcelona private guide will give you ideas and tips for the rest of your stay. Besides, no matter what your interest are, you will find your perfect spot. The Picasso Museum or La Sagrada Familia are the most visited monuments followed by the Gothic Quarter, Saint Mary of the Sea and the Boqueria Market. Finally, we also propose off-the-beaten-path tours to reveal an unusual and authentic Barcelona, such as the Torre Bellesguard or the Poblenou Quarter. If you are reading this words is because probably you love food. You are a gourmet person and you think that you can say you know a country once you understand how people eat. Are we right? In this case, fantastic news, you are on the right spot! We have concocted a tours menu to enjoy the Catalan food discovering the best we have: fantastic bar and restaurants, nice people, tasty food and remarkable wines. In addition, those tours are private so you won’t be sharing neither your guide or your table with strangers. This way you can ask everything to your local guide. Here you haver our tours à la carte. Enjoy and welcome! 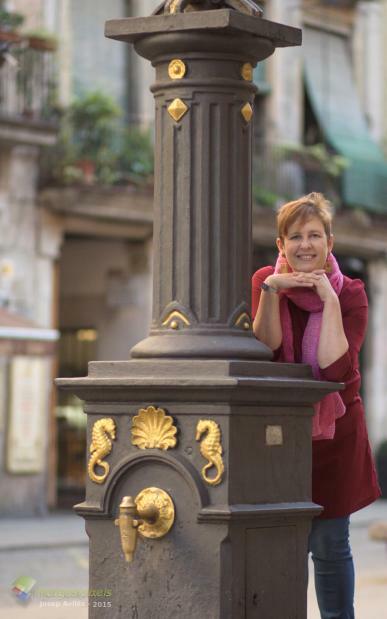 My name’s is Anna, a Barcelona Private Tour guide and in 2012 I started Barcelonina. Thanks to many travelers like you, nowadays I am leading a small agency specialized in private tours. With us you will discover the main Gaudí’s buildings (like the Sagrada Familia), the Gothic Area or the more-than-famous Ramblas. Are you a Gourmet person? if yes, we can arrange for you a Tapas tour to explore the Raval area or a cooking class where you will learn how to cook local specialties (and amaze your friends back home!). Do you like biking? Just just let us know and we will plan the perfect biking tour of the city. Gradually I selected a team of five-star guides. Mercedes has been with us since the beginning and over the years other guides like Lluis, Elena, Clara, Agnès, Mireia and Silvia have joined the club. Under what criterion? To have empathy, to be friendly, to have vast knowledge and to know how to transmit it are some of the conditions required to become a Barcelonina guide. All our tours and activities are private and exclusive. They are planned to be done without rushing, allowing you to take your time to breath, to take pictures and to experience. Forget about carrying a heavy guidebook or reading a map to navigate around the city. Just relax and follow your Barcelona private guide. This is your moment. Do you need ideas to visit Barcelona? A private tour guide’s small agency can be a traveler’s best friend. When booking with us, you will have all our knowledge at your service. Our back office manager Jordi will be glad help you to design your perfect stay in Barcelona, giving advice about the best restaurants or informing you about the best shows in town (just as a for instance). If you are looking for activities in Barcelona beyond guided tours, we can either organize them or provide you with contacts. That way, you gain peace of mind. This way your can relax – and that is what holidays are all about, isn’t it? Do you want to discover Catalonia? The vineyards of the Penedès region, the sinuous shapes of the Montserrat mountain as well as Dalí and his museum in Figueras and his house in Cadaqués are just a few examples of all that Catalonia has to offer. For a more exclusive, unusual and authentic experience, our tailor-made tours of Catalonia are ideal: a discovery of Cava in a 14th century Masia, a visit to an exhibition by Sean Scully in a Romanesque-style chapel and a lesson of wine painting are some of our ideas. Would you like to organize a seminar in Barcelona for your company? Are you looking for an original activity to do as a team while discovering Barcelona? If you are doing “yes” with your head, we are the solution. We have concocted a nice compilation of corporate activities to do in Barcelona, ​​unique and unforgettable. In fact, we can organize for your team from the simplest activity, for example to accompany the group to the restaurant by discovering the Gothic Quarter, until a day with cultural activities followed by a traditional meal. In addition, if your team loves architecture, Gaudi’s buildings await you to visit them in a privatized way. Would you like to discover the local cuisine? A walk through the market followed by a Paella course will delight you. Do you want to decompress after a day of work? A bike ride by the sea will make you feel as a child. From the first contact, we will answer you within 24 hours and you will have a member of our team in charge of your project with whom you can contact by email or reach by phone. In addition, the proposed activities have been tested by ourselves and we are always looking for new ideas. Welcome to Barcelona! See you under the sun. Are you planning a seminar or a corporate activity in Barcelona? Would have missed many sights without Anna. Short cuts we never would have found on our own. Also loved her choices for small off the beaten track restaurants. Highly recommend. Anna is an excellent tour guide! She clearly loves Barcelona, and shares her enthusiasm and knowledge with her clients. My customers from South Africa told me that the next time they come, they want to hire Anna services again. They got delighted with her knowledge, how she puts accross the information and the flexibility to adapt to their own rythm. We will hire Barcelonina services again for sure!